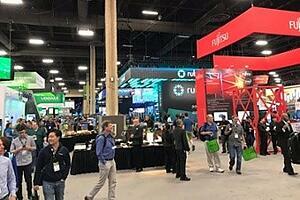 With VMworld 2018 Europe kicking off in Barcelona, it is only fitting to look back to the trends, developments and state of the art technologies that were announced during VMworld 2018 US in Las Vegas. Itility attended this cool event in the US. Read the summary below from our attending Itilians, or read the full story for the indepth-stories of the sessions. Welcome Reception It was Solutions Exchange time. Here we were able to meet VMware partners and have some food and fun. There was time for playing games, networking with each other and also time for some goodies. The reception created high expectations for the upcoming 5 days! Today was the first day of the event. First impression: WOW! First of all, it’s very nice to be in Vegas and to gain knowledge, but what a difference from the previously joined sessions in the Netherlands! The location itself, the ambiance, the crowd and the organization are all mind blowing. We are both infrastructure engineers, so the specialists among us will notice not all topics are our core business. This is the way we work at Itility, we are used to look further than just our own expertise. We strongly believe this is an asset for creating an innovative culture. Today the CEO of VMware – Pat Gelsinger – provided a general session. This year marks VMware’s 20th anniversary celebration. VMware is shaping the future of Cloud, Mobile, Networking, and Security, as well as innovating in emerging areas like IoT, AI, Machine Learning, Edge Computing, and Containers. It was very impressive and inspiring to attend the presentation. For those who are interested, you can review the keynote general session here. Other sessions we joined today were follow-ups of the sessions yesterday. So we learned about more high-level concepts like Container, Docker, and Kubernetes. Although the sessions were similar to the ones yesterday, this did not matter at all. The power of repetition is in the repetition, right? Also we learned more about vSphere, specifically about clustering, vSphere HA and DRS. The other subject today was VMware in which we focused on Cloud Foundation Architecture. Personally I have less experience with Cloud at the moment, but I have ambitions to gain more knowledge so I registered for this cloud deep dive session. Another day full of nice sessions about APIs, Network DRS, vRA (vRealize Automation) and the application of certificates within vSphere. I registered for the ‘don’t sleep on RESTful APIs for vSphere’-session because I guess I am really sleeping on RESTful APIs (I mean I am really unfamiliar with APIs for vSphere). As an infrastructure engineer I was very curious what vSphere APIs are and what added value they have. REST stands for Representational State Transfer Application Program Interface and can be seen as an architecture style, it’s not a standard. It is stateless, which means that the server or client don’t need to know each other’s state. Nowadays a lot of programming languages already talk REST. For instance PowerShell, Python and Java talk REST out of the box. Topics regarding APIs have interested me in any case. I would certainly like to continue working with this topic. The other sessions we joined today also inspired us to broaden our vision. Today we joined some interesting sessions relating to vCenter Server Appliance (availability and best performance), scalability of automated UCS infrastructure, free tools for troubleshooting vSphere environments, VMware validated designs and ESXTOP as utility. Again a busy schedule full of high-level information. I really enjoyed the session concerning ‘Infrastructure on Demand with VMware and Cisco UCS’ since this was a use case of Alaska Airlines. The use case was focused on the path the engineers of Alaska Airlines followed to scale up the infrastructure using automation. The engineers realized that using automation scalability could be performed in an easy way while avoiding human errors and so keeping consistency within the environment. The goal of the engineers was to create an Infrastructure On Demand, a 100% VMware host delivery process. A white paper has been published which includes all the details of each step within the process overview. The last day of VMworld 2018! I have to admit that I am quite exhausted by now, but I have learned a lot. I gained information about handy tools to use, VMware cloud foundation, VMware Validated Designs, considerations when migrating to cloud, VMware Cloud on AWS, Performance best practices for vCenter Server Appliance and much more. According to VMware’s research more and more customers will be choosing for hybrid cloud environments. This made me curious about how to deal with this. Therefore, today I focused more on the business considerations side when migrating to the cloud. We used a structural approach to determine how to create what customers want, a simplified journey. We started with determining the migration dilemmas. We then thought about considerations when migrating to the cloud and determined three main considerations; Security & Compliance, Scalability & Performance and Agility vs Cost Tradeoff. Next we focused on the 6 R’s of migrations strategies; Rehosting, Replatforming, Repurchasing, Refactoring (Re-Architecting), Retire and Retain. This session was extremely insightful due to its structural set-up. When you enjoyed reading this summary and want to learn more, read the full in-depth story here. If you have questions please just leave a message in the comments. For those who want to experience VMworld themselves: next year VMworld 2019 takes place in San Francisco. But first, let’s enjoy VMworld Europe this week in Barcelona! It’s one of the basics of any software study: design patterns. But are they still as important and efficient as before? Find out why we think so.